For those who have been following me long enough, you can tell I’m quite the fan of Santa’s Satanic Helper! Of course, I’m referring to the Krampus. For those out of the loop, Krampus is a creature originating from Germanic folklore. He trails Santa around the world to punish naughty children, while Santa takes care of the good. Specifically, Krampus hits you with his bundle of sticks before sweeping you into a bag full of little hell raisers! 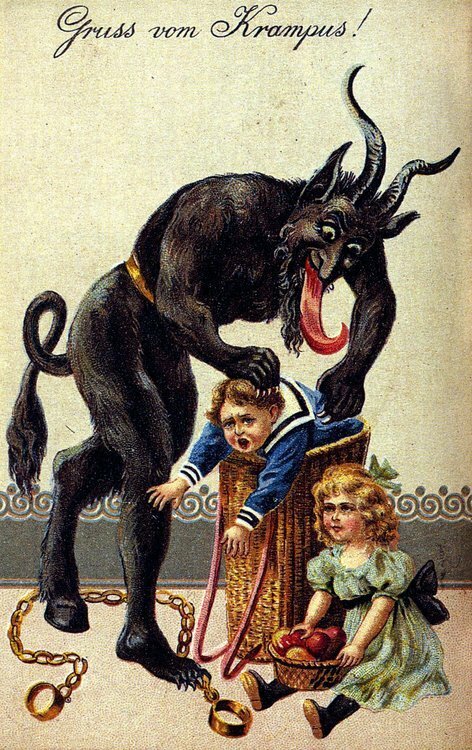 This holiday horror looks like a diabolic monster with coarse black hair all over him, usually with horns and cloven hooves. For centuries, the image of this creature has haunted and fascinated countless people. This was a blast to write! The Krampus is awesome and deserves much more attention here in the States! Anyway, here’s my look back at The Krampus from last Christmas. Here in the United States, the celebration of Christmas is a joyous time of spending time with family, giving gifts to one another, and gross over commercialism. When it comes to Christmas, we use the icon of Santa Claus as the master of ceremonies (and sometimes that other dude too, depending on your religious beliefs.) However, in eastern European folklore, Father Christmas was accompanied by more friends than just plucky elves and flying reindeer. On the contrary, he recruited the efforts of a demonic bodyguard to punish all the naughty children. Look at this way, our yuletide saint can dedicate more time to blessing all the good children of the world! However, Ol’ Saint Nick ain’t the focus today, for his cohort Krampus deserves much attention!